The HTML remote control clipboard tool lets you transfer text and files from the remote device to your local device. When you add a file or folder to the remote devices clipboard, either with Ctrl+c or a right-click and Copy, that item is added to the remote control clipboard queue. You can then click the Clipboard history button on the remote control toolbar and see a list of items that you've added to the clipboard in the current remote control session. 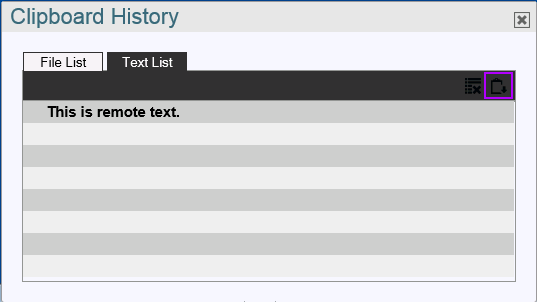 By default, the Clipboard History dialog box shows text items on the clipboard. If you add a file or folder to the clipboard, File List and Text List tabs appear in the dialog box. You can use these tabs to switch between file and text clipboard views. If you want to transfer text to your local clipboard from the remote device, click the text in the list then click the clipboard button in the top right corner of the Text List tab. Files that you've added to the clipboard appear in the File list view. You can click a link to download that file. Note that the downloaded filename changes to "getcbfile". You'll need to manually rename the file to match its original filename. You can also drag and drop files onto remote devices. If you drag the file into a focused Explorer window on a Windows device, the file will be transferred into the folder that is currently displayed in that Explorer window. Otherwise the files will be transferred to the desktop.